Symbols, in my case, images or colors representing ideas, thoughts or emotions. Hi! Its “St. Patrick’s Day” weekend! I have always understood this day to be one in which people of certain cultural descent honor St. Patrick, the Patron Saint of Ireland. Even though I am a descendent of Irish, Welsh and Scottish ancestors, I am not versed in the ins and outs of St. Patty’s Day. Its been a couple hundred years since my ancestors left the isles, you see. Memories Of St. Patty’s Day. So, instead, I grew up with St. Patty’s Day being the day I dressed up in one of my many favorite colors: green. Do you remember being pinched on St. Patrick’s Day if you didn’t wear green? 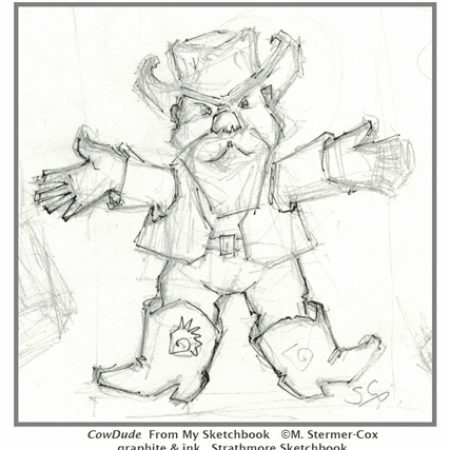 And, drawing endless shamrocks as part of grade school class projects? I liked the drawing shamrock part. However, I was sure to display lots of green to avoid getting pinched. That being said, lets get back to more recent events. To explain, about three years ago the local Rogue Gallery and Art Center started having a “Celtic Celebration Art Show”. 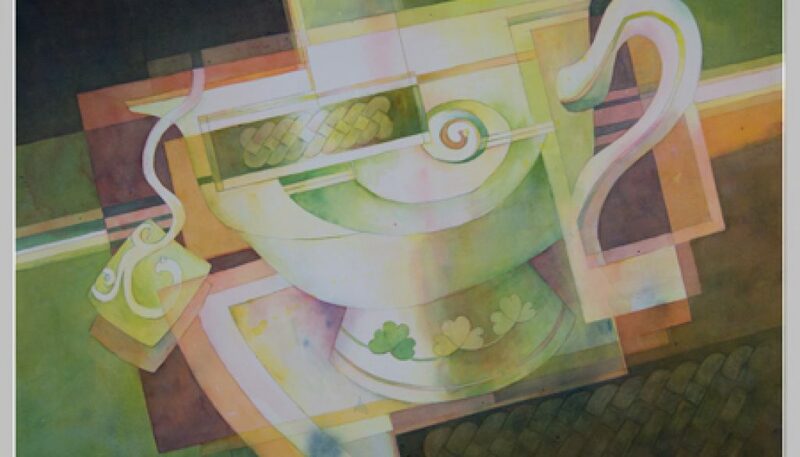 The show sparked my imagination and I started thinking about creating a painting. But what subject and how? 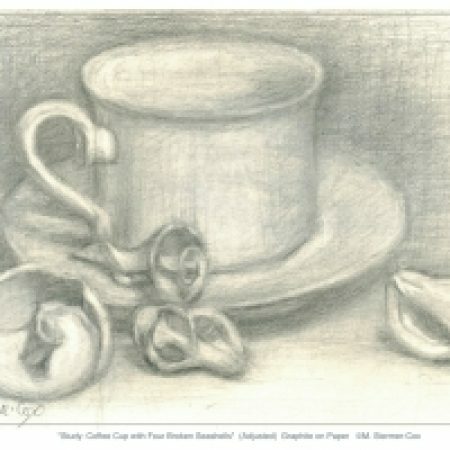 Tea cups and Celtic mythical goddesses came to mind. However, as you might imagine, its quite a road from idea to reality! Thank goodness for research and the tons of information available on the internet. My favorite Celtic things include the wonderful knots and symbols. So, I looked them up and went to work. I think a quick sidebar is necessary here. To explain, the Irish are considered to be one of the Celtic cultures. So, while the symbols I use may have an Irish meaning, they may be used by other peoples as well. Furthermore, since the Celts have been around for a couple of millennia or so, the symbols may be found in many different countries. 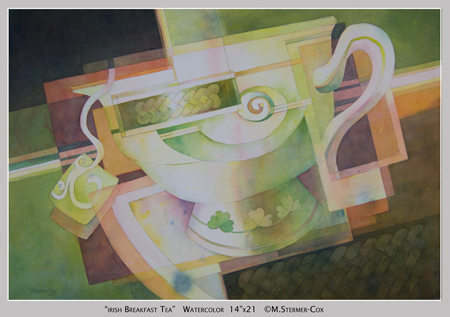 In the two paintings shown here, I have included some Celtic symbols. I’d like to share their meaning with you, however, please note, the descriptions are simplified. Apparently, meaning for many Celtic symbols is complex. For more, I invite you to look at the references listed at the bottom of this page. So, what’s the point to all this discussion about symbols? I wanted to incorporate symbols to give an extra layer of meaning to my painting. True, the titles, plus the green color indicate that the paintings are about something or someone Irish. The symbols just add another layer of meaning to discover. Think of it this way, we get to share something like private messages together through the painting. Speaking of green color. As I stated before, meaning in Celtic symbols seems to be complicated. And, apparently, so is the color green and its association with Ireland. For example, when I was growing up, we all wore green on St. Patricks Day. My point of reference is dominated by how Americans celebrate. We wear green shamrocks or green hats, etc. So, I made the logic leap that green is some sort of national color. Is Green Ireland’s National Color? The national flag of Ireland has green, white and orange. Plus, I think of Ireland as the “Emerald Isles”. And, yet, there is not an official national color apparently! Also, as I learned in my research on line, the constitution of Ireland is encased in blue. Even more, the Presidential standard is blue with a gold harp. So, I wonder, would blue be a more appropriate color? So, what does this all have to do with art? 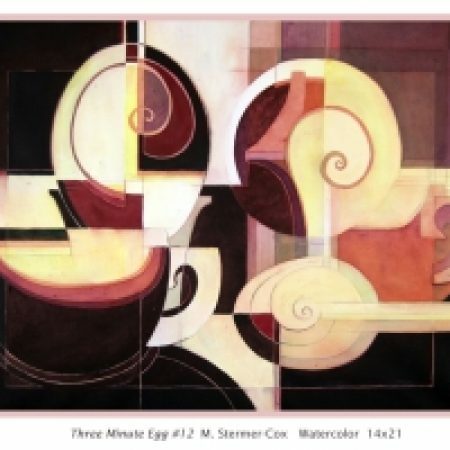 Well, if I’m using a particular color to convey meaning, I figure it helps to ensure a common understanding. Otherwise, meaning is lost or in error. So green it is because, as an American, that’s the color I link with Ireland. 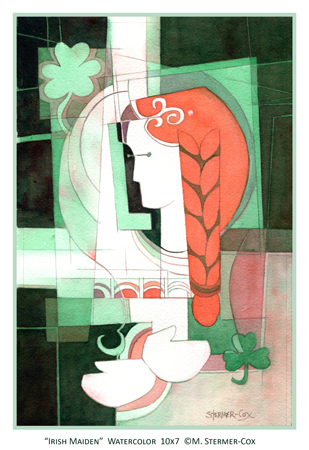 By the way, for a more in-depth description how I created, of “Irish Maiden”, please see my earlier blog posting: Creating “Irish Maiden” from Start to Finish. I’m glad I started out someone simple with all this symbolism. I had an idea about doing a mythical Celtic goddess. Maybe next year or so. And, perhaps she’ll be blue! Saint Patrick’s Day – Wikipedia. GaelicMatters.com. 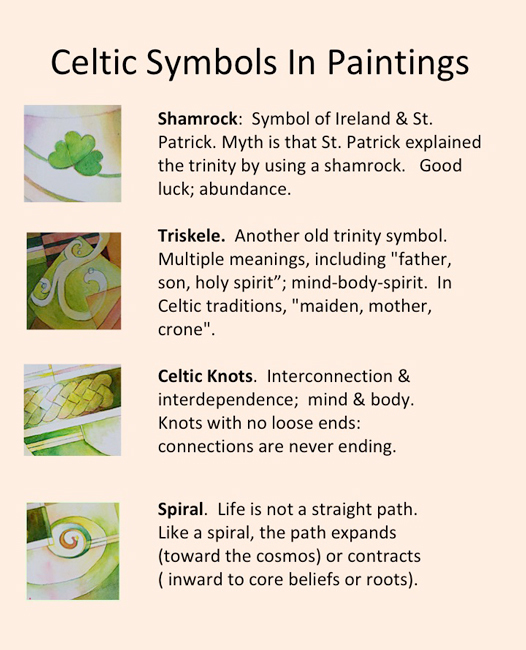 Celtic Knot Symbols – Meaning. TheJournal.ie. So you know Ireland’s national color might not be green, right?